I got the idea for this curry from someone at my Slimming World group, who had seen it online. It's an interesting take on a low fat curry - as a korma usually uses creamed coconut, which is high in fat, instead use a coconut Mullerlight yogurt. And yes, that is the one with the chocolate sprinkles - but the sprinkles dissolve and you don't notice or taste them! I decided to make a vegetable curry for myself and a chicken curry for my boyfriend (I'm not vegetarian so there was no problem with cooking it in the same pan). I had roasted some butternut squash the previous day so as it was already cooked, I cut it into cubes and put it into a frying pan with some large chunks of red onion and yellow pepper. I also fried the cubes of chicken at the same time. I was going to make a korma but I found this bag of tandoori masala spice mix in the supermarket reduced from about £3 to just 45p, so decided to try this instead. I added 1 heaped teaspoon to the pan. As I mentioned, the secret ingredient here is a coconut Mullerlight. They also happened to be reduced in the supermarket, making this meal a real bargain! Stir the yogurt into the curry. The original recipe also called for low fat natural yogurt but I felt the curry had enough sauce - if you were making it to serve 4 I would recommend adding the natural yogurt. 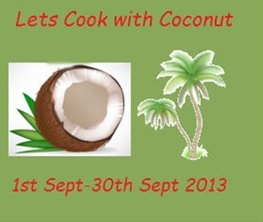 I'm sending this to Let's Cook with Coconut, a new food blogging challenge for September hosted by Simply Sensational Food. I am also sending this to Credit Crunch Munch, hosted by Helen at Fuss Free Flavours and Camilla at Fab Food 4 All. Vegetable curries are usually cheaper than meat-based dishes, and it's a good way to use up any odds and ends of veg; the reduced yogurt and spice mix also made this a bargain meal. Thankyou for sending vegetarian curry this to Lets cook with coconut event. What a splendid idea to keep the calorie content lower in a curry. Thank you for sharing with Credit Crunch Munch! Well I would never have though of this receipe myself but it sounds great and slimming world.